Built strong to last long. We'll work with you to design and install commercial fencing that provides the best long-term value for your property. Your commercial property is your livelihood. When you close up at night, you need the peace of mind that your facility is still being protected. A commercial fence from First Class Fence & Access Control can give you the protection and security you need while increasing your property value. First Class Fence & Access Control is your local expert for all commercial & industrial fencing needs. You’ll be pleased with our professional approach, our wide range of fencing options and our ability to get your job completed on time and on budget. When you contact First Class Fence & Access Control about a commercial or industrial fence, we’ll visit your property and discuss your specific needs. We’re comfortable working with property & business owners, facility managers, architects, engineers, municipal officials – anyone who needs quality fencing for a fair price. Many factors are involved when selecting a fence. Security requirements must be met, but appearance and style may also be important considerations. Our access to a wide range of fencing materials means that you’ll be able to find a fence that suits your requirements. We’ll also help you select gates for your fence that provide secure & convenient access for vehicular and pedestrian traffic. Our experienced, well-trained technicians will complete a first-class installation of your fence project. We can also provide follow-up maintenance and repairs as necessary. We’re ready to earn your business for all commercial & industrial fencing in Illinois. All of our jobs start with a free quote for commercial fence installation or other fencing services. 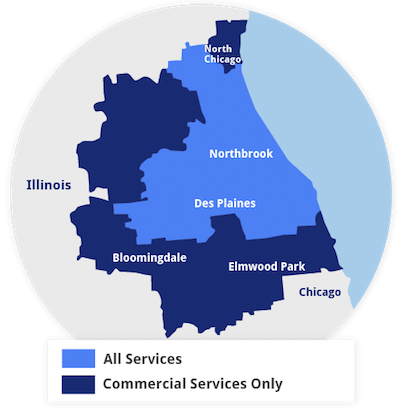 If you're located in Northbrook, Glenview, Riverwoods, Highland Park, Glencoe, Deerfield, Highwood, Wheeling, Chicago, Lincolnshire or a surrounding town or city, let us help you!